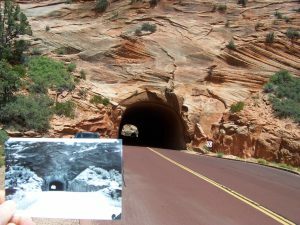 May 22, week 3 – Earl and Ethel had two photos at Zion National Park in their album. One was of the west side of the “short tunnel” and one of what is called the Altar of Sinawava. 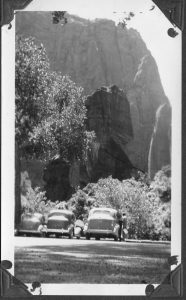 We originally thought that the later photo was in Yosemite NP since it was located in their album with other Yosemite photos. Thanks to helpful park ranger staff we got things straight! 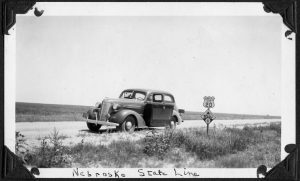 Ethel can be seen next to their ’37 Chevy in the photo. 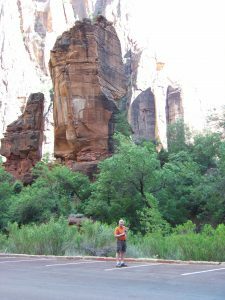 Carl stood in the same location holding a copy of that photo. Sinawava is a Paiute Native American name for the coyote spirit. This seems appropriate since the spirit is associated with tricking humans. 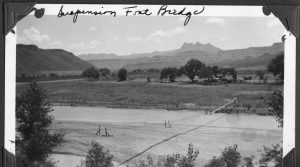 Since we crossed the northern Utah border on May 10, a picture of a suspension foot bridge set in a pastoral scene along a river has been challenging every Utah, county, and NP visitor center staff member that would hear us out. 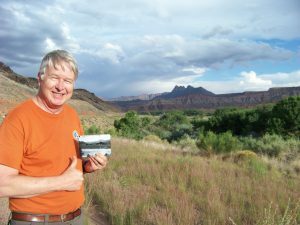 Last Tuesday as we were about 10 miles out of Zion NP though, I mentioned to Lynn that the color banding in the hills around us seemed a lot like those alternating bands seen in our mystery photo. There was even a river running along the highway! Could this be the area in the mystery photo? We rounded a corner and could not believe our eyes. 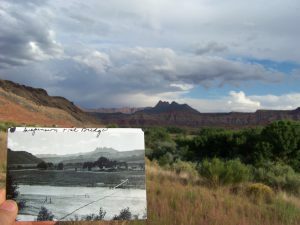 At UT Hwy 9 mile-marker 21, west of Rockville we solved another unknown photo location with persistence and luck! We chatted up a fellow unloading his truck who said the farm across the river in our picture was still in the same family as in 1937. He encouraged us to drive down and meet them. 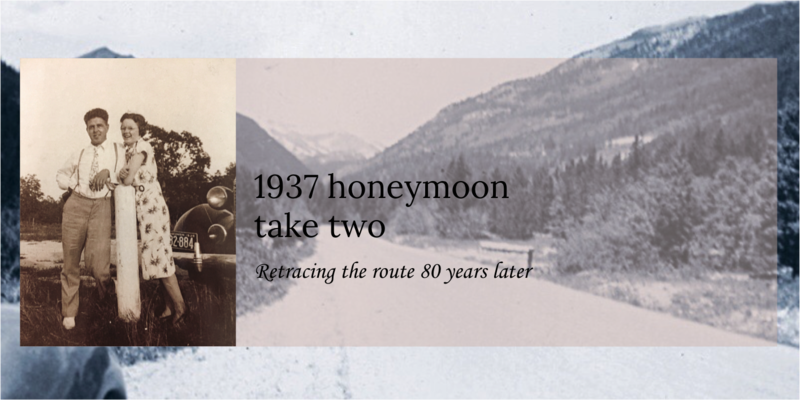 So, we crossed a one-lane bridge, drove up to the farm and shared our incredible 81-year old tale! 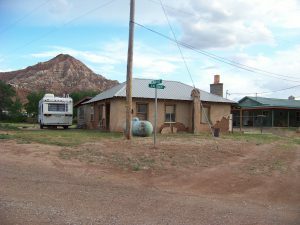 The older adobe house in one of the following pictures is the same one visible in Earl and Ethel’s 1937 picture. The people we met now live in the newer green house immediately behind it. The suspension foot bridge was taken down only 12 years ago! It is now a part of history. Wow! What a wonderful opportunity and a great find. I don’t want to sound stupid but is the water gone that was under the bridge or is it a marsh now? Good detective work – really does look like the spot. No, the river is still running as it did then and, still flooding. A low concrete bridge was installed to replace a rickety steel bridge. The concrete bridge is designed so that during flood stage, the river water flows over the top! During those times the folks living in the valley may have to drive a few miles to another bridge downstream, or, wish the footbridge was still in place!